How can I create a false mirror reflection with Iray? what i mean with false reflection is: a figure stands in front of a mirror, but what shows in the mirror reflection is something/someone different. 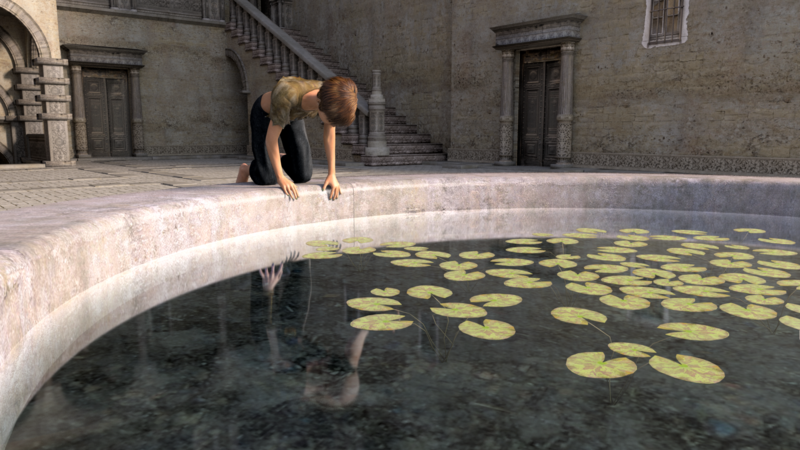 i know i could, if i made 2 parallel scenes (one with each figure), just somehow use a 1st render with the "reflection" figure combined in the mirror's mat for the 2nd render with the figure in front. but it's not what i want to do, also i want the scnene to be a bit dynamic, i might change poses or whatever. the idea is do this (or the shadow trick mentioned below) 1 ONE render, without postwork in gimp or so. had done this in 3DL a while ago with a lot of fumbling, it was possible with ubersurface. there was a different setting for each figure - one to make 1 figure have no reflection, the other to make it invisible in front of the mirror, or something like that (been a while). i did the same with shadows too - a figure in front of a wall, but the shadow is another figure's. Create two renders and copy/paste or cutout the part required in the mirror in post-processing. up to now, it never crossed my mind to search for gimp advice in the daz forums, maybe i should? is this because iray really tries to reproduce actual physical reality? Post processing is essential to using Daz for what you are describing. In fact, post processing is extremely useful to fix things like poke through and gamma adjustment. Get used to using it. If I were to do that scene, I would make one with each character. Using Photoshop, I would use the clone tool to put the image in the mirror that you want. Pretty straightforward. You did; I'm sorry I missed that. Why? The finished image matters, not how one got there. let's say, just for argument's sake, that i would be interested, what are "scripted pathtracing and aweSurface"? never heard that ever, please explain? it's like if you asked: "i'm a vegetarian, and i'm sick of the eternal cheese sandwich, can someone tell me a yummy sandwich alternative? ", and you have 1 person telling you "i dunno, why don't you try ham or bacon", another tells you "sandwiches are not so healthy *wink emote*, you should eat a fresh salad *smile emote*", yet another says "personally, i love chicken & fries with a milkshake", one more asks "why are you a vegetarian? can't you eat like normal people? srsly what's your problem" - AND FINALLY, if you're lucky, someone will say "try tofu slices, it's delicious well spiced" or "in some stores you can get vegan sausage" or "try fried zucchini slices". Perhaps you should read what folks tell you. You say you managed with 3Delight; they are very different, one allows 'cheating', Iray the one that doesn't really like cheating is the one you wish to use - to cheat. After reading what they've said, you might surmise that what you want may not be possible; I don't know of a way you could do it. My dislike of many forums is folks being critical of those offering helpful - but in your case - unwelcome suggestions. Makes one leary of bothering in future. You take your whole scene minus your figure and duplicate it behind your mirror, and cut out the mirror surface entirely. Then you mirror your duplicate scene too (meaning you put either X or Z depending on your scene to -100%). This way you'll create an elaborate 'mirror world' where you can put whatever you want on the other side. The only thing that won't 'mirror' is if you have an HDRI lighting or something similar where you can see the outside of an environment. If I could give you a thumbs up I would.